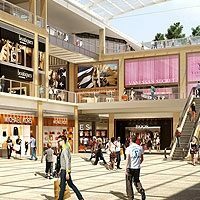 The Westgate Oxford Alliance is marking the 10-month countdown to the opening of its £440 million Westgate Oxford development by unveiling 13 new retail brands, and two new restaurant venues  further signaling Oxfords future status as the UKs next premium fashion and food destination. Welcoming a strong mix of brands to the new 800,000 sq. ft. (74,300 sq. m) shopping and leisure destination, which now stands at almost 70% pre-let and in solicitors hands, retailers announced today include Mint Velvet, Smashbox, Gant, Body Shop, T2, Hotel Chocolat, Guess, JD Sports, local Oxford retailer Burrows+Hare, Trotters, Accessorize, Lush and Aveda. The impressive new line up confirms the confidence of a number of premium and high street brands who have committed to Westgate Oxford, ensuring its standing as one of the largest and most highly anticipated retail and leisure destinations to open in 2017. Dirty Bones new venue will be the brands first outside London, demonstrating Oxfords appeal as the city of choice for brands looking to embrace its widespread and affluent catchment, volume of tourist shoppers and students, and its unique blend of old meets new style that makes it one of the UKs most iconic cities. Naomi Howard, Leasing Director at Land Securities said: We are delighted to welcome such high calibre brands to our already impressive line-up at Westgate Oxford. Demand to date has been fantastic for both the retail and leisure offer, ensuring that when October comes Oxford will be a buzzing and vibrant destination to shop, to eat, to drink and to meet friends and watch the sun set over the citys famous spires. Located in the heart of Oxford city centre, investment in Westgate Oxford has seen the west end of the city undergo a complete transformation which will result in more than 100 new stores, 25 restaurants and cafes, a boutique cinema, and a wealth of new public spaces. Westgate Oxford will open to the public in October this year  in time to ensure its retailers will benefit from the Christmas trading period, and shoppers in Oxford and beyond can experience exceptional fashion and food brands, all just an hour from London.